Every year on the day after Thanksgiving, I allow my friends and clients to purchase a certificate for a FULL SESSION to be used in 2016, at a super discounted price. 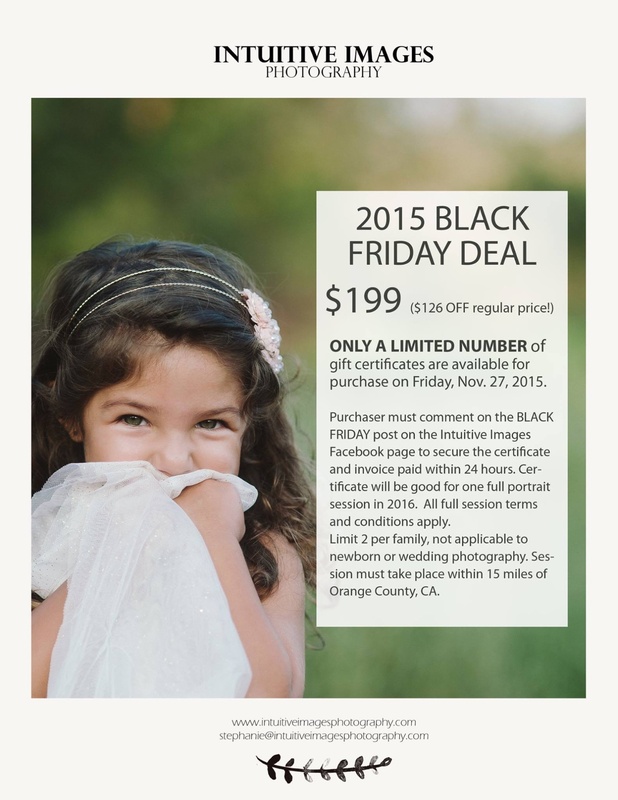 Gorgeous family photos at $125 off the regular price? Score! You can even choose to receive the paper certificate, and give it as a gift to a family or someone you love! Best. Present. Ever. As for the terms of the session, it is for a full portrait session. That means you get an hour of shooting, on location, for up to five people, and you get all your final edited images in high resolution in a beautiful online gallery. This year, these sessions must take place within 15 miles of Orange County, and all sessions must be scheduled by October 31, 2016. (They don't have to take place before that date, but your date must be on the calendar by then.) It cannot be used for newborn or wedding photography, and it's limit 2 per family. There will be a VERY limited number of certificates available. Last year, I bent the rules a little, and allowed more people to purchase this deal than usual, and some families had a tough time getting a date for their session. So in order to better serve everyone, I have to stick to my guns this year! I can't tell you exactly how many of the certificates there are, but they will go QUICKLY! So please, please be ready- I don't want those of you who wait and wait for this deal wo be disappointed! Enjoy Thanksgiving with people you love, and I'll see you on Friday morning! Grace - So interested in this deal! Will it be available to purchase this year?? Or something similar? Julia Quinn - I would like to purchase at least 1 of these packages please ( if you have 2 that would be even better). I have been meaning to get them done with you and this would be a great opportunity.